Do you find that sometimes people argue over the silliest and most unworthy things? Yuye and I hardly argue since he has a great temper (not me though but he lets me get my ways ;)) so whenever we do argue, it sticks in my head like gum on your shoes. There was this once when he argued with me over cauliflower and potatoes. How and why in the world would we do that? 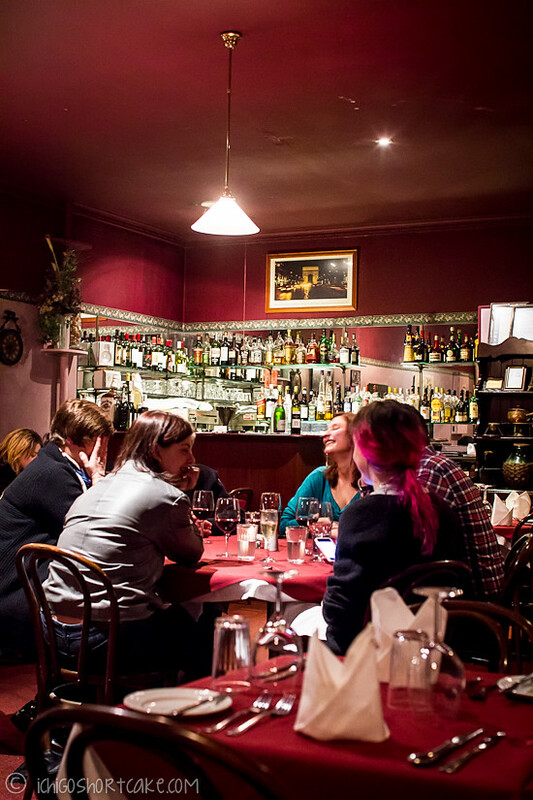 Well…it all started with our visit to La Gaulois, a small family style French restaurant in Glen Waverley. We walk past this restaurant all the time as it’s very close to Yuye’s house but have never gone in until that day. It was a cold wintery night and there wasn’t all that many people inside. We were quickly settled in by the loveliest lady and offered complimentary baguette bread. 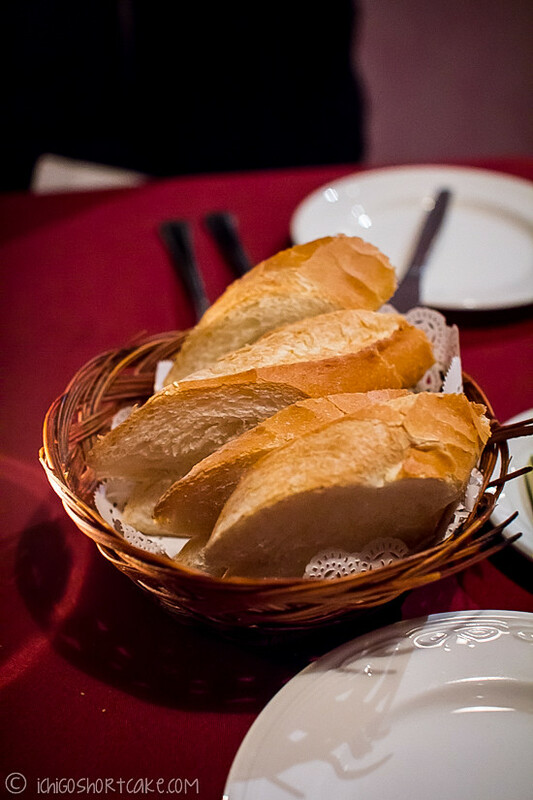 Although delicious, it was just regular bread that you can purchase from bakeries so it wasn’t anything special. Like any good French bistro, the menu items sound delicious and inviting, some classics and some not, but they all sound wonderfully French. 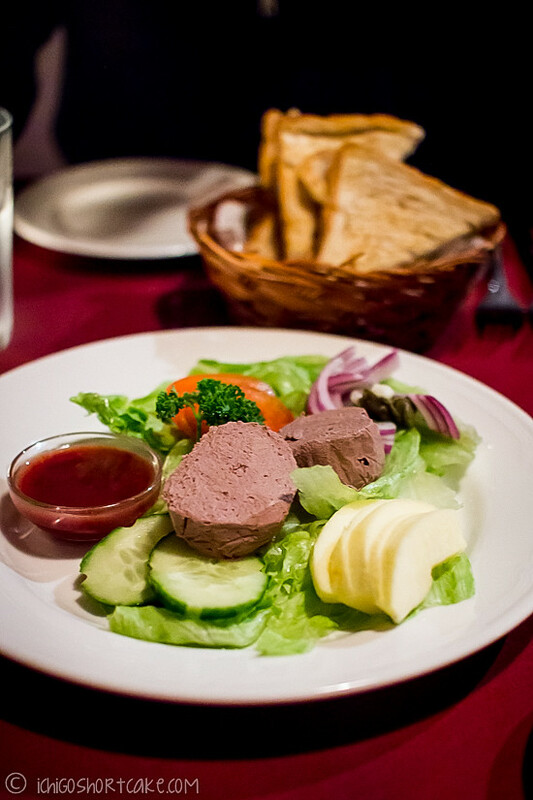 As an entree we opted for the Les Chef Pate Maison which is chic liver pate prepared to the chef’s recipe with cognac, accompanied with toast and cumberland sauce ($13.90). As you can see, the presentation of the dish wasn’t all that fine dining or like other French restaurants I’ve been to but the pate was still very delicious. It went well with the veggie side and was wonderful with the crisp apples, but I found it didn’t really need the sauce as it was quite sweet. We needed extra bread (which came in the form of the complimentary bread) to finish up all the rich pate. 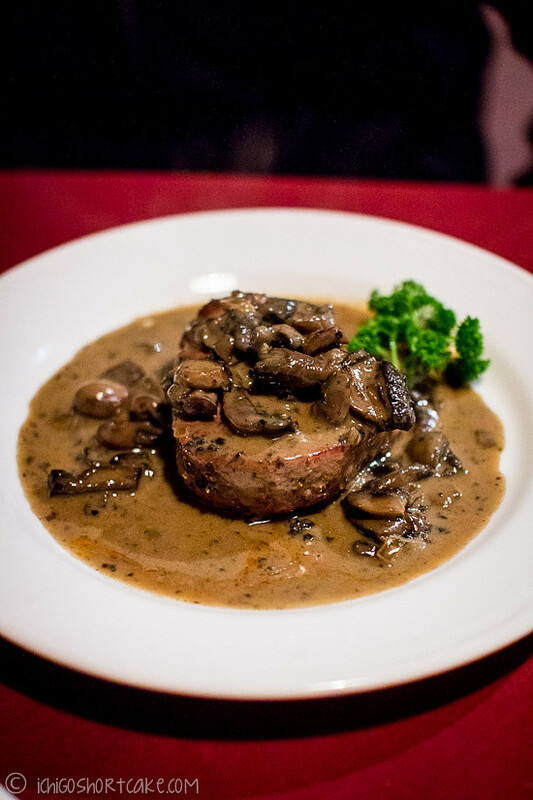 For a main dish, Yuye ordered a special steak of the day with porterhouse and mushroom with brandy sauce. They were definitely not cheap with giving sauce like a lot of restaurants are which was a good thing. However, Yuye and I both thought the sauce wasn’t as good as we expected. It was quite buttery and shiny but slightly on the bland side. 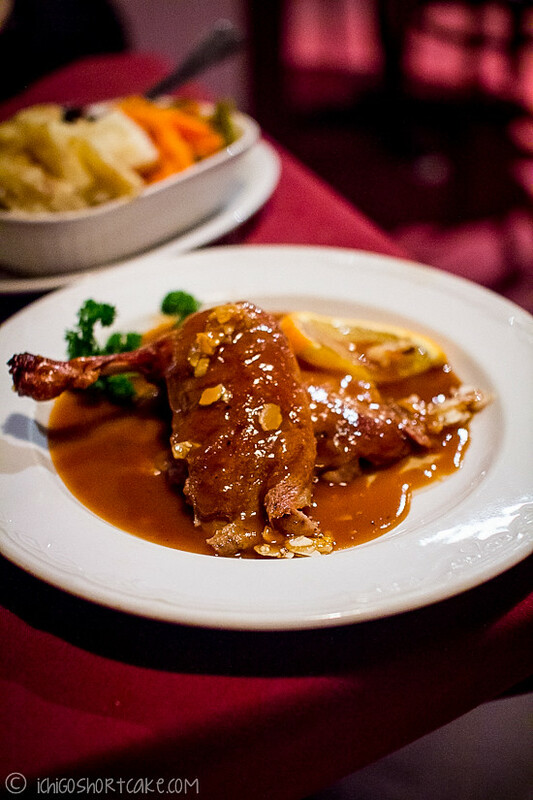 I ordered the Canard Aux Noix which is oven baked duck served with an orange and walnut sauce and caramelised almond crunch for $29.90. I was expecting a similar duck dish as other French restaurants but it was actually quite different. The duck wasn’t dry for one. They were also very generous with the sauce for this dish and I had ample spare at the end. The sauce was not too rich to overpower the dish but was sweet enough to compliment the duck. I thought it was a lot better of a dish than the steak. It was however, quite informal and ‘homey’ for the price we paid and the almost fine dining setting in the restaurant. Here comes the hero of the story. 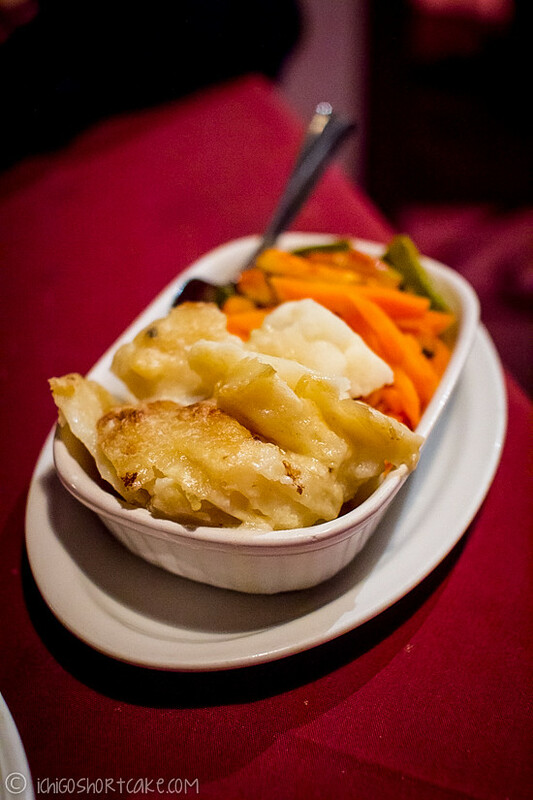 Our main dishes were served with a complimentary side of mixed baked vegetables. The ingredients included carrots, cauliflower, zucchini and potatoes. Probably only ONE potato. Because I was the one who ate and it and apparently Yuye didn’t have any. So when I mentioned to him that I wanted to make a gratin with the huge cauliflower I bought and left over potatoes, he said to me “they don’t go together, why are you putting them in the same dish?”. He didn’t realise that we had in fact had the very dish just a few nights before. The worse thing is, he didn’t actually believe me when I said there was potatoes. The argument began. It ended quite quickly like all of our arguments without really coming to a conclusion but I made it anyway in protest and well, it tasted fantastic. Still not sure if he believes me though. After the mains, we decided to order desserts and coffee. That was a big mistake. If we had left it at that, we would have walked away happy but desserts really left too much to be desired. Firstly we ordered the sticky date pudding for $8.90. It wasn’t expensive at all which was great, but the caramel sauce wasn’t quite right. It had a very shiny surface which suggests either the sauce has split or they put too much butter in it? I’m not too sure but it was different to the usual sauce we get with sticky date pudding. The sauce was also a lot more runny. I didn’t mind this dish as much as Yuye though. 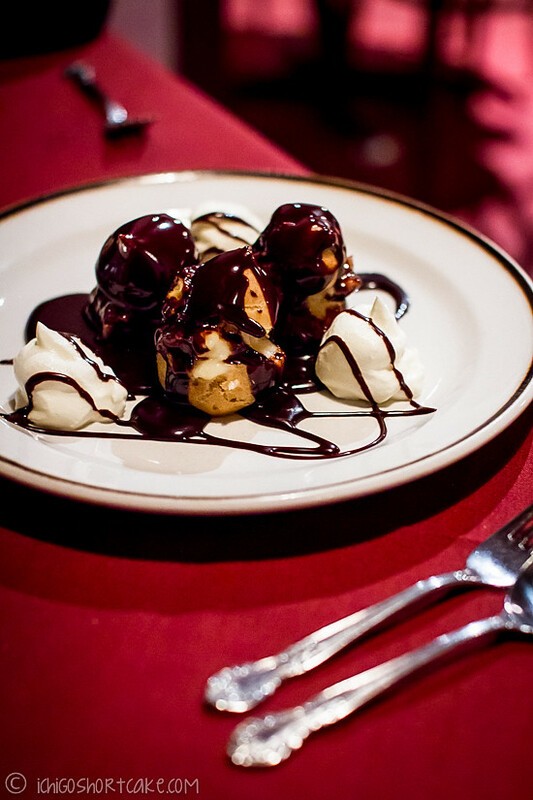 What upset me was the profiteroles with Cointreau cream and warm chocolate sauce ($9.50). It looked quite spectacular but taste wise it was no where near how it looked. The choux pastry was a bit soggy and tasted like it’s been left out for awhile and the cream was lukewarm. The chocolate sauce didn’t make it any better. We had trouble finishing this dish. 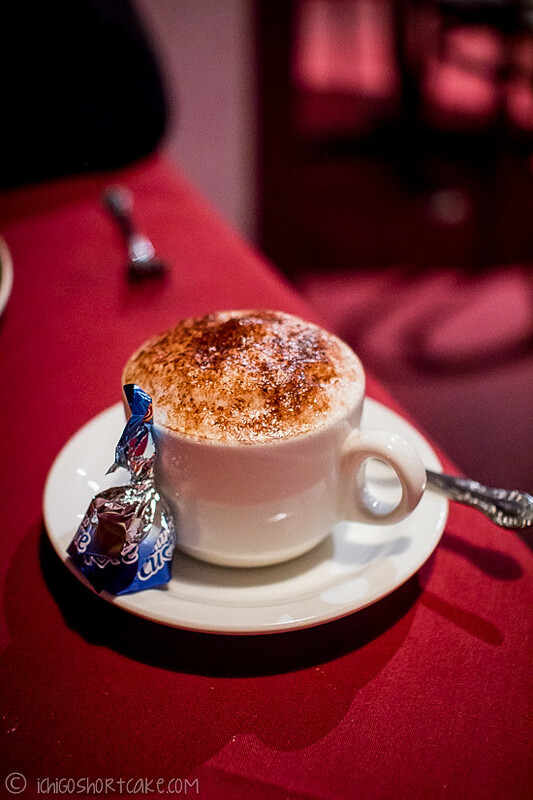 I didn’t expect great coffees from this restaurant but what we got was no where near the standard of regular cafes. The foam was done incorrectly, as you can see it’s too foamy and not creamy enough. The coffee was watery and slightly burnt. At least it came with a nice chocolate. What impressed me a lot about this place wasn’t the food and definitely not the desserts but the service and attention to detail by the waitstaff. Although there wasn’t too many patrons, the lady who served us walked around the room so many times during the night and had our water refilled countless times. Every time she poured the water, she’s say ‘thank you’, shouldn’t it be the other way around? I felt almost indebted to her for her kindness. Aside from the terrible profiteroles and less than desirable coffee and sticky date pudding, I still enjoyed my meal here. I liked the ambiance of the restaurant, the top notch service and homey food. Quality of some of the food definitely needs to be improved though. Question time: Do you argue with your partner over petty things like potatoes and cauliflower? How do you normally solve the issue? 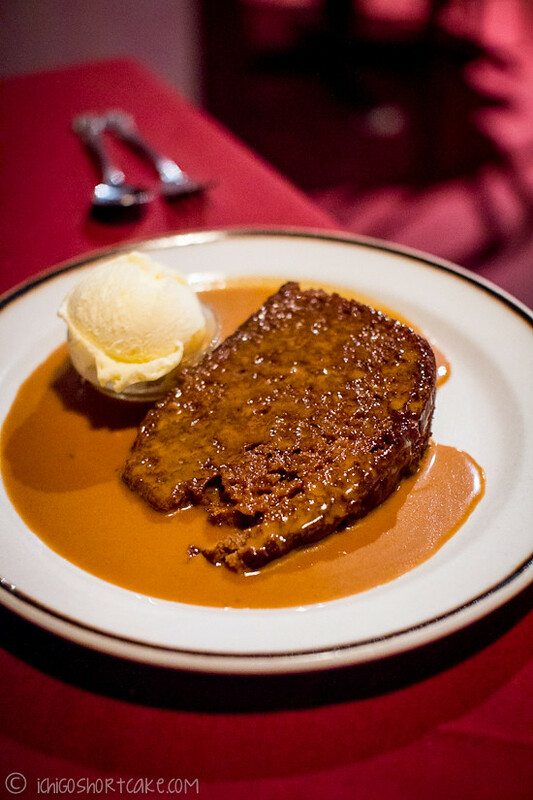 Yes, that sticky date pudding looks so sad! Stephen and I fight ALL the time over silly things. Then we sit in a stroppy silence for hours until one of us cracks and apologises, lol. Haha Marty and I have fights but we have this rule where we try to talk it out before we go to bed that night (frustrating for me as I’m someone who thinks it’s sometimes good to sleep over it and talking at 3am means that you’re more prone to irrationality haha). Can’t remember the last time we fought though, but it was probably me telling him off over something stupid he did! That’s a shame this restaurant wasn’t terribly fantastic. I do feel bad when I go to a place where we get good service but the food isn’t up to scratch. It’s like you WANT to like the food because of the effort they put in the service, but you can’t cos the food is terrible.